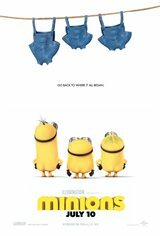 Through the ages, the Minions, including Kevin, Stuart and Bob, have served many masters, accidentally killing many of them. When they find themselves without anyone to serve, they get depressed and embark on a quest to find a new evil boss for their brethren to follow. They meet Scarlet Overkill (voice of Sandra Bullock), a stylish villain who lets them live in her place and tasks them with getting the Queen's crown. Their travels take them all over the world and finally, they face their biggest challenge everto save all of Minionkind from being annihilated.